"A hearty beef vegetable stew from leftovers you have on hand. 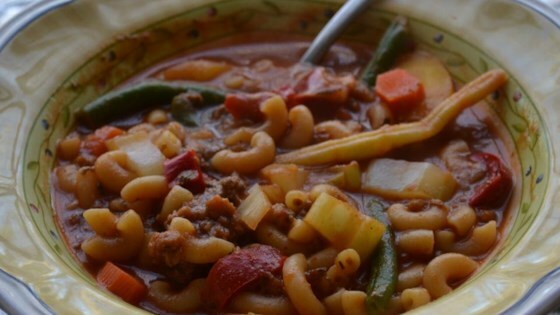 I love this recipe on a cold Texas winter nights." Brown the hamburger meat with onion and celery. Drain (if it is fatty hamburger meat). Add water and carrots, then cook 'til carrots are beginning to get tender. The carrots will be crunchy unless you cook them a fairly long time. Add leftover vegetables, macaroni, tomato sauce, Italian spices, and salt and pepper to taste, and simmer until the flavors blend and all ingredients are warm through. I really liked this quick meal. I left out the carrots so it was fast and used wide egg noodles instead of elbow. I also used more sauce and less water so it was kinda like a stew, it was great! Made this with a large can of V-8 juice instead of water and tomato sauce. Also didn't use celery and fresh carrots, only the frozen veggies.